In 1858 the firm, H. C. & M. Hulbert, was established at 83 John St. in downtown New York City. They were dealers in paper and papermaker's supplies. Proprietors were Henry C. Hulbert and his cousin, Milan Hulbert. Successors to H. C. & M. Hulbert in 1874 were H. C. Hulbert & Co., owned by Henry C. Hulbert alone. This business was first located at 13 Beekman St. and later at 53 Beekman St. Successors to H. C. Hulbert & Co. in 1900 were Bassett & Sutphin, the partners being Charles F. Bassett and Joseph H. Sutphin. The beginnings of Bassett & Sutphin were described as follows in Wood Pulp News, 21 April 1900, "A new firm came into existence in the paper field of this city this week. Messrs. Charles F. Bassett and Joseph H. Sutphin, heretofore of the firm of H. C. Hulbert & Co., have formed a partnership under the style and firm name of Bassett & Sutphin. It will be remembered that the old firm of H. C. Hulbert & Co. was dissolved by mutual consent on March 1, as the senior member, Mr. H. C. Hulbert, wished to retire from active business, because large financial interests in various corporations demanded his full attention... [The] new firm now succeeds to the business of H. C. Hulbert & Co. and M. Plummer & Co., as mail agents and dealers in paper and paper manufacturers' supplies. M. Plummer & Co. dissolved partnership by mutual consent on March 27..."
This ad for Bassett & Sutphin appeared in Wood Pulp News, 26 Dec. 1903, when they were located at 45 Beekman St. Bassett & Sutphin moved from Beekman St. to Lafayette St. in 1907. 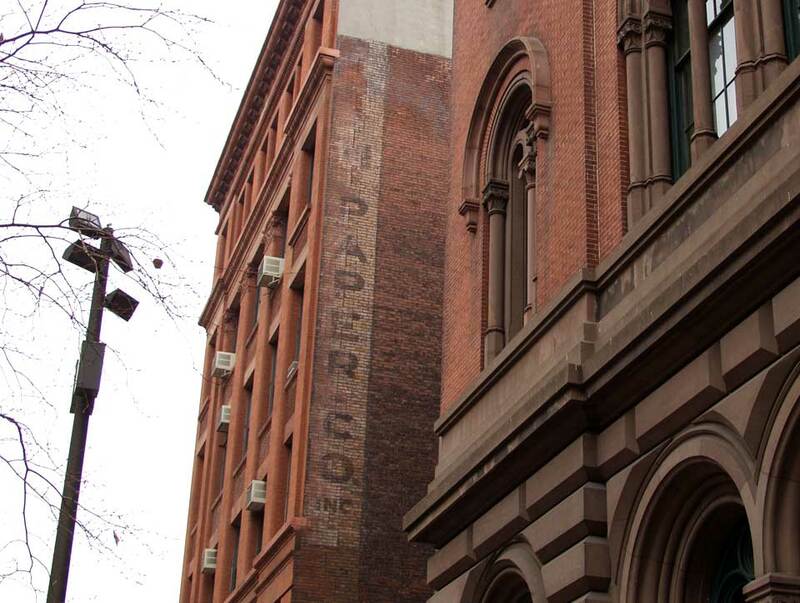 Successors to Bassett & Sutphin were Sutphin Paper Co., whose sign appears above at 439 Lafayette St., where they were in business from 1917 to 1937. Proprietor at the Sutphin Paper Co. was the son of Joseph H. Sutphin, Henry H. Sutphin. Henry Carlton Hulbert (1831-1912) was born in Massachusetts and went into the paper business in New York in 1851. He was recorded in the 1880 U. S. Census, age 48, living in Brooklyn, when he was a dealer in paper manufacturer's supplies. His obituary, New York Times, 25 April 1912, read as follows, "Henry C. Hulbert, financier and philanthropist, died yesterday morning from gastritis at his home, 49 Prospect Park West, Brooklyn. Born in Lee, Mass., in December, 1831, he entered mercantile life in New York when he was 19 years old. He started with the firm of White & Sheffield, paper manufacturers, and became a partner when the business was reorganized under the firm name of J. B. Sheffield & Co. In 1858 he started the firm of H. C. & M. Hulbert. This concern still operated under the name of H. C. Hulbert & Co., although Mr. Hulbert retired from active business in 1910. He continued his office, however, at 116 Nassau Street. Mr. Hulbert was Vice President of the Importers' and Traders' Bank and the South Brooklyn Savings Bank. He was also a Director of the Pullman Company, the Franklin Trust Company, the United States Insurance Company, and the New York Life Insurance Company, and Vice President of the Society for the Prevention of Cruelty to Children. He is survived by two daughters." A great deal of detail on the life of Henry C. Hulbert is available in Genealogical and Personal Memoirs Relating to the Families of the State of Massachusetts, prepared under the editorial supervision of William Richard Cutter, New York, Lewis Historical Publishing Company, 1910. This is available on the internet in google books. Charles Franklin Bassett (1862-1916) first appeared in New York city directories in 1893 when he was a member of H. C. Hulbert & Co. He was recorded in the 1900 U. S. Census living with his father-in-law, Henry C. Hulbert, at 49 Prospect Park West, Brooklyn. Charles Bassett married Henry Hulbert's daughter, Carolyn, 14 June 1892. Like Henry Hulbert, Bassett was born in Massachusetts. An obituary in the magazine, The American Stationer and Office Outfitter, 30 Dec. 1916, read, "Charles F. Bassett, member of the New York firm of Bassett & Sutphin, paper merchants of 54 Lafayette street, died December 27 at his home at Summit, N.J., 'Fairview.' Death followed an attack of pneumonia which lasted ten days. Mr. Bassett was born in Lee, Mass., October 9, 1862. After receiving his education in his native town, he came to this city in 1879, and entered the paper business as an employee of the large paper and supply house of H. C. Hurlbert [sic] & Co. In 1890 he became a partner in the firm, and in 1893 married Carolyn Hulbert, daughter of H. C. Hurlbert [sic]. For a number of years he made his home at 49 Prospect Park West, Brooklyn, of which he was in [sic] influential citizen. In 1900 he was attorney in liquidation for H. C. Hurlbert [sic] & Co., and at the same time acquired an interest in M. Plummer & Co. As the results of his efforts the two houses were consolidated, and with his brother-in-law, Joseph H. Sutphin, Mr. Bassett formed the new firm of Bassett & Sutphin. Besides his wife he is survived by one son, Hulbert D. Bassett, now a Harvard student, and a daughter. The funeral services took place at Summitt last Friday." Joseph Halsey Sutphin (1840-1920) was born in Freehold, Monmouth County, New Jersey, 17 Aug. 1840. At the time of the 1850 U. S. Census he lived with Ebenezer Conover, a farmer, in Freehold, N. J. In 1880 he lived with his father-in-law, Henry C. Hulbert, at 194 President St., Brooklyn. Joseph Sutphin married Hulbert's daughter, Susan. He first appeared in New York city directories in 1868 when employed at H. C. & M. Hulbert as a bookkeeper. He received a brief notice in the New York Times, 27 Feb. 1920, reading, "Joseph H. Sutphin, formerly President of the Sutphin Paper Company at 439 Lafayette Street, died yesterday, age 79 years, at his home, 50 Prospect Park West, Brooklyn. He retired a few years ago." Henry Hulbert Sutphin (1885-1954) was Joseph Sutphin's son. He was born 24 Feb. 1885 in Brooklyn, N. Y. After the Sutphin Paper Co. closed in 1937 he seems to have had several employments outside the paper business. In 1942 he registered for the World War II draft when employed at Pratt & Whitney, West Hartford, Conn. His obituary in the New York Times, 28 Jan. 1954, read, "Henry Sutphin of West Hartford, manager of the Hartford brokerage office of Hornblower & Weeks died here yesterday at the home of a friend. He had come to Greenwich to attend the funeral of his brother-in-law, Alanson T. Enos Jr. Mr. Sutphin, a former Greenwich resident, was 68 years old. He was graduated from Harvard College in 1907, and was a member of the Twentieth Century Club and the Bond Club in Hartford. Surviving are his widow, Caroline Squibb Sutphin; a son, Donald S. Sutphin of Ossining, N. Y.; a daughter, Mrs. Sally S. Joslin of Stamford; two sisters, Mrs. Enos of Greenwich and Mrs. Josephine D. Brinsmade of New Haven and four grandchildren." The Hulbert / Bassett / Sutphin grave site in Green-Wood Cemetery, Brooklyn, includes individual stones for Henry C. Hulbert, Joseph H. Sutphin, and Henry H. Sutphin.